As another academic year unfolds at the University of Windsor, two things are apparent on campus. There is that wonderful, annual feeling of anticipation and optimism among our students, and there is a continuing change to the physical environment of our campus. 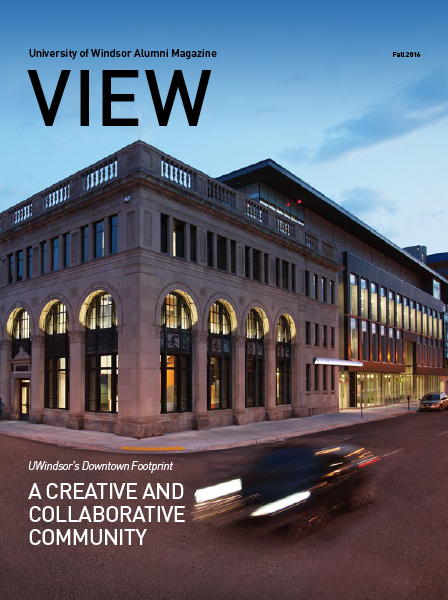 You will find both that spirit and sense of renewal on display in the fall edition of VIEW. There is the inspiring story of twins Alexa and Liza DiCecco—both Outstanding Scholar students and both engaged in research. There is the groundbreaking work of PhD candidate Krithika Muthukumaran who is studying an antioxidant that might provide protection against Alzheimer’s and Parkinson’s. And the greening of the main campus continues to gather momentum. The David A. Wilson Campus Commons is replacing a parking lot with a basketball court, performance stage and meeting and gathering spaces. UWindsor professor emeritus and alumnus David Wilson generously made a million-dollar donation to make the project possible. Our two pedestrian thoroughfares, Sunset Avenue and Patricia Road, will be renamed Turtle Island Walk and Alistair MacLeod Walk, respectively, to recognize the history of First Nations land on which the university sits, and to honour the late professor, MacLeod, an acclaimed writer who taught at our university for three decades. Fall 2016 also marks a time when we are moving into an exciting new chapter of our university’s history with the emerging downtown Windsor campus. It more closely aligns our education and scholarly capacity with the community, and is positioning our students in an environment where they can best discover what their education can mean for their future. The new address for the School of Social Work and the Centre for Executive and Professional Education, at the corner of Pitt and Ferry, has positioned students, faculty and staff closer to the many agencies and services that support communities of need. Nearby, construction work continues at the site of the historic Windsor Armouries, and across the road on the site of the former Tunnel Bar-B-Q. This will be the new home of our School of Creative Arts that is scheduled to open in fall 2017. It puts our students in the heart of the active downtown arts community. But, like all of our buildings, they are ultimately about providing the best possible learning environment for our students. VIEW is about providing a snapshot of the countless stories of achievements by our students, faculty, staff and alumni. It is also an opportunity to update readers about the campus. Yes, the world is changing. And yes, the University of Windsor is contributing to that change.